Our founders, Pat and Bart, felt strongly that taking care of children meant to provide a haven where childhood can unfold freely and with the time needed to make meaningful connections and develop lasting friendships. We have built on their vision with our quality auxiliary programs, which allow children to spend additional time on campus with well-known and beloved teachers, friends, and peers. Bixby Auxiliary Programs are open to current Bixby students. Here at Bixby, we believe that auxiliary programs are an extension of the school day. 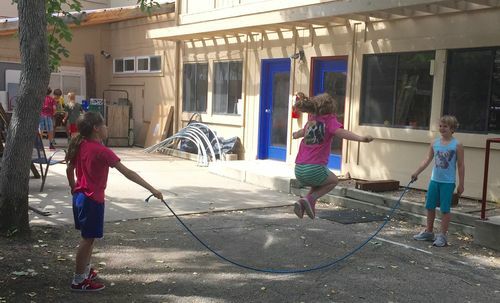 More than just care, students in after care are included in programming which include stimulating conversations through social justice chats, coordinating themes during the school day, PlayWorks games, meditation, and activities to encourage personal and social growth in a fun and safe environment. Students are encouraged to have autonomy in their decision making and to grow into their individuality. Bixby School provides care on select days when school is not in session. Activities include field trips, in school performances, and camp activities. Registration for Bixby Blast Days open one month prior to start date via the Active online registration system. Enrichment classes are offered every semester to current students at Bixby. Registration will open one month prior to the beginning of classes. If you have any questions about Auxiliary Programs, please contact our Director of Auxiliary Programs, Julie Trinh, at auxiliary@bixbyschool.org.